^ The author notes that these two texts are only preserved in corrupt versions and share a rather convoluted editorial history. ^ Goodenough, Ward Hunt (1996). Prehistoric Settlement of the Pacific, Volume 86, Part 5. American philosophical society. p. 48. ISBN 9780871698650. ^ Holm 2014, p. 35. ^ Kiernan 2017, pp. 49-50. ^ Kiernan 2017, p. 50. ^ Theobald, Ulrich. China Knowledge. "Chinese History – Yue 越 (Zhou period feudal state)". 2000. Accessed 5 December 2013. ^ Allen, Richard. "Star Names – Their Lore and Meaning: Aquila". ^ Behr 2002, pp. 1-2. ^ a b Behr 2002, p. 2. ^ Behr 2002, pp. 2-3. ^ Behr 2002, p. 3. Behr, Wolfgang (2002). "Stray loanword gleanings from two Ancient Chinese fictional texts". 16e Journées de Linguistique d'Asie Orientale, Centre de Recherches Linguistiques Sur l'Asie Orientale (E.H.E.S.S. ), Paris: 1–6. Holm, David (2014). "A Layer of Old Chinese Readings in the Traditional Zhuang Script". 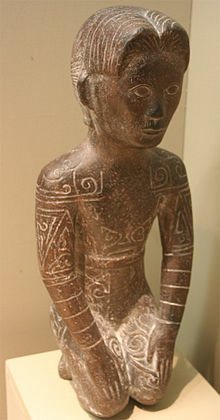 Bulletin of the Museum of Far Eastern Antiquities: 1–45. Kiernan, Ben (2017), Việt Nam: A History from Earliest Times to the Present, Oxford University Press, ISBN 978-0-195-16076-5. Li, Hui (2001). "Daic Background Vocabulary in Shanghai Maqiao Dialect" (PDF). Proceedings for Conference of Minority Cultures in Hainan and Taiwan, Haikou: Research Society for Chinese National History: 15–26. Zhengzhang Shangfang 1999. "An Interpretation of the Old Yue Language Written in Goujiàn's Wéijiă lìng" [句践“维甲”令中之古越语的解读]. In Minzu Yuwen 4, pp. 1–14. Zhengzhang Shangfang 1998. “Gu Yueyu” 古越語 [The old Yue language]. In Dong Chuping 董楚平 et al. Wu Yue wenhua zhi 吳越文化誌 [Record of the cultures of Wu and Yue]. Shanghai: Shanghai renmin chubanshe, 1998, vol. 1, pp. 253–281. Zhengzhang Shangfang 1990. "Some Kam-Tai Words in Place Names of the Ancient Wu and Yue States" [古吴越地名中的侗台语成份]. In Minzu Yuwen 6.